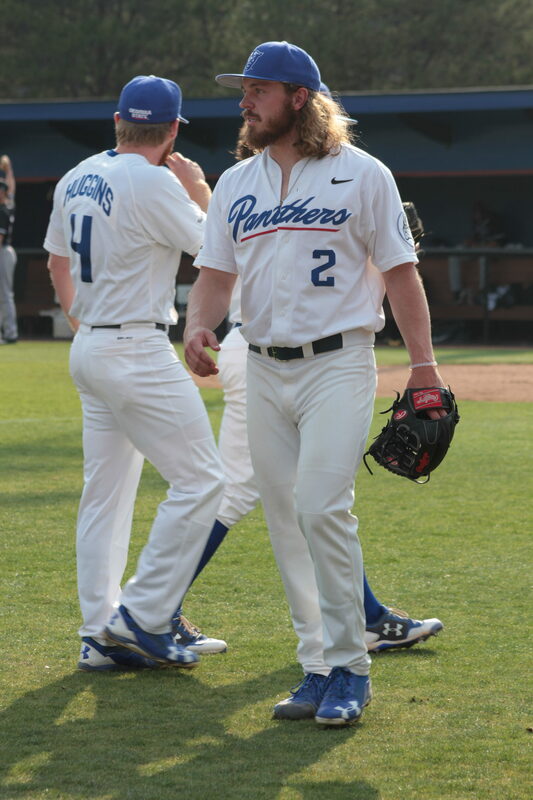 Rhett Harper walks onto the field after warming up for a Georgia State baseball game. Making a position switch from outfielder to a pitcher on a Division I level is a tough task to accomplish. What’s even more challenging, though is becoming a closer; a prolific closer at that. However, by noticing how quickly senior Rhett Harper has adjusted to his new position on the Georgia State baseball team, one may have a difficult time believing the position switch was as difficult as it sounds. Harper, who committed to the Panthers baseball team as an outfielder, mentioned that Head Coach Greg Frady ultimately ignited the idea of him becoming a pitcher for the ball club. The idea didn’t arise naturally, but more so as a desperation move by Coach Hardy, which, in the end, proved to be beneficial to the team’s success. While Harper closes out games effortlessly, he admitted that there were some aspects of the transition from outfield to pitcher that were challenges. With Harper being the team’s closer, pitching in a game for more than a few innings would be atypical. But perhaps the most nerve-wracking aspect of being a closer is actually closing out a game. According to Assistant Athletic Director Allison George, Harper has three saves and an ERA of 0.93. So just how does Harper remain cool, calm and collected in these clutch situations? He admitted that he gets a thrill out of having the pressure mounted on him in those closing moments, which is the mentality that every closer should possess. Harper credited his coaches for his development in his new position. While he has put in a tremendous amount of hard work into his craft, he knows that a considerable amount of his success has come from the coaching staff. There’s no doubt that Harper is a naturally talented baseball player, but one may wonder if he would have been better off as an outfielder. Harper, however, knows that he is better equipped to help the Georgia State team move forward as their closer. Along with being a stud on the baseball field, Harper is also a scholar in the classroom. Harper currently has a 4.2 GPA and seems to have the recipe to making A’s. “I just make some time; I try to prioritize practice with school and whatnot,” Harper explained. He also credited mom and dad for his success in school. Harper has endeavors to become a better pitcher. He knows that to continue to be that clutch closer the team needs, he has to continue to work on his craft. Two scoreless innings with three strikeouts to finish a 13-5 win over Alabama A&M (5-3-16).